In Western society where people are wealthier than in other places, it is literally possible to dress in any kind of clothing. Nevertheless, despite all the possibilities, most people wear more or less the same kind of thing. Ritual garments are few and far between: The flowing black robe of a judge is not seen on the street, nor is Queen Victoria's innovation -- the white wedding dress. Gold braid is left for military officers on parade. The apparel of monks of Tibetan Buddhist orders. nuns of various Buddhist orders in their robes. What garments do nuns in the Tibetan Buddhist denominations wear? The four Tibetan Buddhist denominations are Nyingma, Sakya, Kagyu and Gelug. We sometimes hear them referred to in the following way: Nyingma are called Red Hats, Kagyu are also called Red but sometimes, Black Hats, and Gelug, of whom the Dalai Lama is a representative, Yellow Hats. The epithets derive from the crowns or ceremonial headdresses of the lineage-holders and are especially used by speakers of Chinese. That is not to say that these expressions are correct. 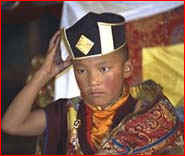 The Karmapa's Black Crown [Tib. : shwa-nag] an image of which is currently displayed on the Khandro.Net home page, is the actual headdress conferred by the Chinese ruler when he, among many others, witnessed a crown woven from the hair of dakinis suspended above Karmapa's head. It is being kept for now at the Karmapa's monastery in Rumtek, Sikkim. In this photo, we see the replica that is used in certain practices. The Sakya (pron. in East Tib. : Shacha) have a distinctive ceremonial hat generally known as the sa-zhu. At a distance it resembles a turban adorned with a diagonal ribbon of rank. This effect is due to the fact that the lappets of the hood are kept in a raised and crossed position. Though this headdress is red, it is not generally referred to by colour. The original version came into use towards the end of the Sakya Pandita's (1182 CE) life. It is called kyang-zhu [sounds like chong ju] meaning extended -- a reference to the original long side flaps that formerly were left hanging down on either side of the face. Because of their auspicious benefit for the Sakyas, the lappets that once may have served a utilitarian purpose were folded and crossed like the forearms of meditation deity, Vajradhara. The Gelugpa's pointed yellow hood has come to be known as the Tsongkhapa hat after the 15th century Kadampa reformer who established that denomination. The fringed hat that resembles a horse's mane or a Roman helmet, is worn in procession by monks of all 3 of the younger (or, Sarma) denominations. It is often referred to as the Vinaya hat. Here we also see some red pandita or, scholars, hoods. Like the pointed red hood, a scoop-shaped sun hat is often depicted in historical images of panditas. Under the blindingly bright sunlight of the region, it is still common custom, though mainly by country folk, to fold a cloth in such a way that it will sit on the top of the head to act as a sun shade. According to Vinaya, Buddhist monastic rule, the wearing of hats except for ritual headdresses is prohibited. When His Holiness the Dalai Lama received an International University honorary degree the strength of that prohibition mandated that he immediately remove the "mortar board," which he held in his hands for the rest of the ceremony. For public appearances under theatrical lighting, the Dalai Lama has popularized the crown-less eye-shade that was formerly used mainly by tennis players. It is permissible since it is not a head-covering. Besides the Black Crown of the Karmapa, there is a distinctive headdress though not as significant, for two other high tulkus [incarnate lamas]: The Red Hat Lama and that of His Eminence Tai Situpa. The role of these two eminent lamas has traditionally been intertwined with that of the Karmapas. They are teacher and disciple to one another across incarnations in a relationship that is called the Golden Rosary of Mahamudra (Great Seal, ie. Symbol or Attitude,) which is the supreme teaching of the Kagyu. Also, at the ritual of celebration of the successful traditional three-year three-month and three-day retreat, celebrants wear the red Kagyu hat associated with a red form of Chenrezi. Red is also the traditional colour of joy and festivity in many Asian countries. Since the expression Red Hat can refer to two very different things, the Old Schools (Nyingmapa, Shakya and Kagyu) and also the Shemarpas of the latter group, it can perhaps contribute to confusion. This mix-up happened, to the dismay of some members of the media, in a few reports about the emergence of the 17th Gyalwa Karmapa from Tibet. When it means the Old denominations, it is a reference to the color of the Pandit hats worn by the scholars of these schools. Later, the Indian tradition of saffron yellow for the pandita hoods was reintroduced and the Gelugpas became known as "Yellow Hats". There is a kind of irony in the fact that "saffron yellow" is associated with those who reject the pursuit of material goals. Yellow robes are worn, not only by some Buddhist lineages (for example, the Chinese monks of Shao Lin) but also by wandering Hindu ascetics. The contradiction comes from the fact that yellow is the colour of gold -- it stands for great wealth. In a great part of Asia, the very soil itself is yellowish, so that colour "refers" to our Earth. By extension then, yellow also symbolizes a basis -- the Foundation. ". 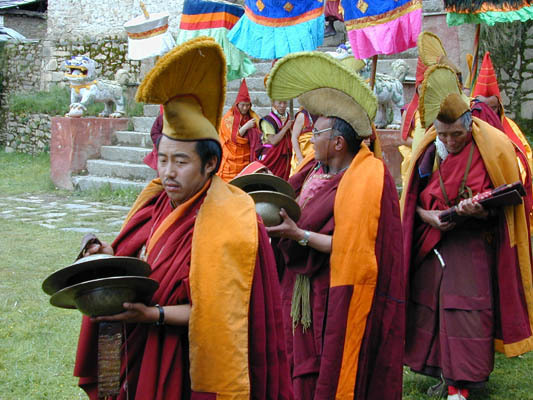 . . according to Tibetan oral tradition the ceremonial monastic hat in early India had been yellow, the color of the earth, symbol of discipline and the foundation from which all good things are born. However, this had been changed to red, symbol of fire and victory, after the Hindus began gaining the upper hand over the Buddhists in public debate . . . the hat remained red thereafter. The tradition carried over in Tibet during both the early and late phases of the spread of the doctrine, but Tsongkhapa felt that the main threat to Buddhism in Tibet was not unsuccessful debate with non-Buddhists, as it had been in classical India; rather, it was the general laziness and lack of discipline of the Tibetan practitioners. Therefore he changed the color of the hat back to the original yellow, bringing it back to the earth element and the firm foundation required for successful engagement in the higher practices." Yellow is also associated with death and dying; it is the colour of dead leaves. The Tibetan denominations are associated with various colors that distinguish their robes. For example, the Gelugpa is sometimes known as the Yellow School. As we have seen, yellow/gold signifies shila or discipline. That is the emphasis in the practice of Gelugpas who were known as Kadampa prior to their reformation. The Nyingma is known as the Red School because of their deep red clothing. Instead of the saffron yellow shirt worn by monks of other denminations, they wear a red or maroon one. There are several famous Nyingma lineages and two types of religious communities: gendün marpo who are celibate monks and nuns that wear red, and gendün karpo, or white sangha of non-celibate practitioners referred to as gö-kar changlo'i-dé, or "long hair and white kilts." However, these yogis drape a red shawl (Tib. : zhen) over their white robes. The Sakya are known as the Multi-colored School, not after their garments but the stripes that border the outer wall of the original and main Sakya Monastery. Sa-kya means pale, or grey, earth a name referring to the soil's color at their first monastery's site. The red stripe stands for Manjushri, the white for Avalokitesvara and the black for Vajrapani. Together they symbolize knowledge, compassion and self-control. Their distinctive hat identifies them, but its colour does not. Sakya and Kagyu, too, also have traditions in which people dress in white. In fact, the Kagyu have been called the White School, because of the thin white clothing of founders, Marpa and Milarepa (repa: cotton-clad.) Their Indian tantric teachers, Tilopa and Naropa had worn white cotton draped garments. These founders of Kagyu were not monks, but householder-yogis who may also have worn their thin cotton to demonstrate their mastery of tummo (Skt. tapas, heat [generation.]) In Chinese, Kagyupas are referred to as "white robes," due to the profound impression made by the cotton-clad yogis. Some ngakpas (non-celibate tantric practitioners) wear white to symbolize their life-long commitments. It is meant to underline their having fully accomplished the essence of the Vinaya (the monastic code,) and that they now, in outwardly living in contradiction to the Rule, are trying to transcend it while inwardly scrupulously following its spirit. That path emulates that of Mahasiddha Saraha who is said to have been able to juggle three iron balls so that all were aloft at the same time. When he left the monastery in order to apply his accomplishments to worldly activity as a yogi, he said, "I have been a monk in name only all my life, but from this day on, I truly am." In many cultures, individuals undergoing ritual purification dress in white. Because the cloth is un-dyed, it is considered purer. Also, it resembles snow, clouds and other clean or unearthly substances. White is also the colour of a shroud, the final garment. Therefore when white is worn by a yogi, it can serve as a remembrance of the that there is an urgency to practice. It also indicates to others that the practitioner is in a special state as a result of their proximity to death. Dyes used to tint the coarse material used for the robes of religious (and also, military) orders are generally the cheapest -- the most readily available. They used mainly to come from plants. In the countries near India the choice was yellow, as from onion skins, and the dark reds from lac or madder root. Farther east, grey, black and brown are the choice. They can be derived from tree bark. In China, yellow and red were reserved for the emperor, nobility and officials. There the blue, gray and brown hues worn by peasants are also worn by monastics. The dark blue is from the indigo plant. Bright blue is the color of the vests of Bonpos, the non-Buddhist practitioners of the old religion of Tibet. There are two different explanations given for the bright blue border around the armholes of Tibetan monastic robes and vests. One is that it symbolizes Padmasambhava, since it is the bright shade of lapis lazuli, a color that, like purple, is associated with royalty. In depictions, he is portrayed wearing a bright blue inner robe of quality befitting a prince. The other is that it commemorates Huashang, and though his view of spontaneous enlightenment was defeated, nevertheless it is commemorated and the connection with China is maintained in this symbolic way. If someone is dressed in a traditional garment, but in unusual colours, you can be reasonably sure that the person is not a celibate monk or nun. A distinguishing feature of monastic dress, the bare right arm. The zhen or shawl is draped in such a way as to bare the right arm or shoulder. Priests in the earliest cities, as far west as Sumer (Mesopotamia) wore their garments in this fashion. So did those of Mohenjodaro (in the Indus Valley,) as portrayed by the clay figure at left. In ancient times, cloth was generally not tailored to the body, which entails cutting a precious length of cloth. It was merely draped, or gathered and wrapped. A right-handed person generally finds it awkward to wrap a shawl in such a way as to bare the left side, so this ancient style is also related to modesty as it demonstrates that no other person assisted in dressing. The sari of Indian women when worn in the national style, is also draped in such a way so as to bare the right arm. But the side a garment is attached can also convey status. Compare the fastening side of the tunics of subjugated peoples with that of the ruling class in traditional China. Notice, too, the subservience inherent in the buttoning practices of western women's clothing. The garments are meant to be detached by a person facing them! The exposed right arm is also related to the Western shaking of hands -- no weapons are concealed. It is also a sign of the readiness to work, since most people are right-handed. Also, in many parts of the world the left hand is discretely hidden since it is used for cleaning after using the toilet. This mark of deference is a customary sign of respect to the Buddha. The Sutras mention it speaking of the disciples' actions as they knelt to ask for teachings. In formal portraits we see garments arranged deliberately to expose the right but conceal the left arm. Monks shave their heads primarily as a gesture of renunciation in imitation of the Buddha. He cut off his princely topknot in imitation of the wandering ascetics and forest-dwelling yogis of his time. Itinerant Hindu renunciate practitioners known as sadhus, and other kinds of yogis too may, according to their tradition, dress and act in contrast to monastics. Instead of a shaven head, they may vow to keep their hair (and sometimes, their nails) long. Instead of saffron, they dress in white (see tummo above) and so on. However, those with high realization may consider such symbolic contradiction elaborate and unnecessary. They dress in whatever way they are used to, including in monastic robes. When their hair is long it is braided or made into dreadlocks to keep it out of the way and to prevent tiny sentient beings from making their homes in it. Braids can sometimes serve as a kind of mala -- a counting device for keeping track of mantras. Among monks and yogis, as it is in society at large, we cannot judge the importance or role of someone by the details of their garb or general appearance. Therefore, we need to be mindful of the way we react to and behave with people, especially if we are inclined to evaluate status based on appearances only. Habits or Robes of Monks and Nuns Can we judge the book by its cover? The habit or uniform of Buddhist monastics consists of three outer garments that symbolize the Three Jewels. The robes probably will have been generously donated by lay people. The main garment in Tibetan orders is the traditional chuba which is worn by both men and women in Tibet. It is a wrap-around type of gown that is economically cut and that attaches at the right arm-pit with a special button, brooch or buckle. The sleeveless version tre.che is worn by monastics, and it should be visibly repaired or patched to commemorate, among other things, Buddha Shakyamuni's poverty after he left his royal estate. Often the upper-body garment -- the zhen or shawl of a ritual costume -- is sewn of three pieces, or made of rows of folded squares in such a way as to simulate patchwork. This is especially noticeable in tangkas depicting renowned teachers. The sleeveless robe of women is a wrap-around tunic, or what is called a jumper in North America, that can be adjusted to fit the changing form of a woman. The very generous folds of the traditional pattern has, since the 1970's, given way to a sleeker contemporary model. It is generally worn with a short, square and complementary-coloured paler, blouse. Often, the collar of the blouse is folded outside the diagonal closing of the outer garment to form a cuffed border resembling a shawl collar. A similar garment made of thin material can be worn underneath, and there can be more than one of those, as was the custom of Japanese women before Westernization. Married women wear the pang.den, an apron made of 3 lengths of striped woven cloth sewn longitudinally. Its corners may be embroidered or appliqued with triangular patches in a flower motif. These welcome, frame and protect any new life beneath the apron. There are prescribed undergarments for both ordained men and women. An outer sleeveless vest was developed for the use of women and it is popular with men, too. As noted above, the various denominations or schools have characteristic colors. In the West, some individuals and groups have adapted the robes to suit individual occupations or personal requirements. For example, polo shirts or t-shirts or suit jackets in the appropriate hue are an option, and a tubular lower garment (Hindi: lunghi) or a divided skirt similar to that worn by Japanese martial artists may be worn by a woman who prefers to wear trousers. The wearing of a robe, like other precepts and vows comprising the pratimoksha rule of monastic order, functions as a protection for the wearer. It frees him or her from the problems or attentions associated with the wearing of everyday clothing, and it functions as a reminder to the wearer (and the public) of his or her vows as a renunciate. There are many other rules concerning distinctions in monastic garb, such as those underlying the differences between the dress of those who have embarked on the renunciate's path and those who have entirely renounced worldly life. It is considered all right for a yogi (especially one who started out as a monk, e.g. Kyabje Dilgo Khyentse Dorje Chang) to dress as a monk, but it is not all right for a monk to dress as a yogi, or as a "householder." It could be considered disrespectful for a layperson to wear these robes, but it is a breach of vows for a monastic NOT to dress in them. If you like to dress in a Tibetan chuba, try not to emulate monastic dress. Perhaps it is a good idea to ask the lama whether it appears misleading.